The present day art gallery comes from the royal collections of the old Trinidad Museum, as well as acquisitions, donations and bequests. Its history began during the reign of Charles III, when he tried to create a single art collection under one roof. But it was not until the reign of Fernando VII when the Royal Museum of Painting and Sculpture was created, on 19th November 1819. The kings death caused inheritance problems and endangered the unity of the collection, but with the disappearance of the monarchy in Spain the museum became national property and became known as the Prado National Museum. The museum is located in the old General Hospital built by the architect Sabatini under the orders of Charles III of Spain, and was designated a Historic-Artistic Monument in 1977. It is home to one of the world’s most highly-prized permanent collections. The museum’s collections come from two sources, the old MEAC (Spanish Museum of Contemporary Art) collections and acquisitions made by the museum itself, in addition to works bequeathed by the Catalan artists Salvador Dalí and Joan Miró. The permanent collection is located on the second floor, divided into rooms dedicated to Nonell, Anglada Camarasa, Iturrino, Zuloaga, Solana and María Blanchard, among other early 20th-century Spanish painters; the Cubist movement, Picasso, Dalí, Miró, and a room entitled "Ideas". 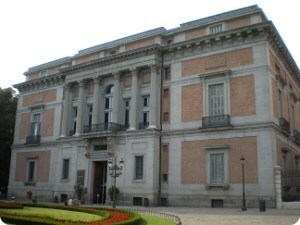 Temporary exhibitions are held in the museum’s main venue, the Velázquez Palace and the Crystal Palace. The latest trends by the newest up-and-coming artists are on display in the area called "Espacio UNO", which occupies the ground floor of the main building. Picasso's "Guernica" is one of the most important works exhibited here. 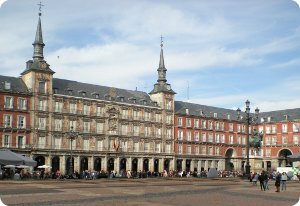 The Plaza Mayor, a grand arcaded square in the center of Madrid is very popular with tourists and locals alike. The symmetrical rectangular square features a uniform architecture. The name of the plaza has changed over time. Originally it was called the "Plaza del Arrabal" but became known as the "Plaza Mayor". It was built during the Habsburg period. It is located only a few blocks away from another famous plaza, the Puerta del Sol. Measuring 129 by 94 meters, and is surrounded by three-story residential buildings having 237 balconies facing the Plaza. It has a total of nine entrance ways. The square was redesigned with gardens, but those were removed in 1936. At the center of the square is a bronze statue of King Philips III, constructed in 1916 by Jean Boulogne and Pietro Tacca. Plaza Mayor as we know it today is the work of the architect Juan de Villanueva who was entrusted with its reconstruction in 1790 after a spate of big fires. The statue of Philip III dates to 1616, but it was not placed in the centre of the square until 1848.